The last recipe featuring Febuary’s Veggie of the Month, the potato, is a true classic – oven baked fries! They are super easy to make and so much healthier than the deep fried kind. Obviously fries lose about half of their amazingness if you have to eat them without a proper dip. So here’s a variety of three dips that go perfectly with fries. You could also try dipping chicken fingers, mozzarella sticks or veggies! One of them is a fry sauce that seems to be particularly popular in Utah and also in Argentina, where they call it “Salsa Golf” (there’s a legend behind it – read about it here http://www.saluxuryexpeditions.com/blog/salsa-golf-ketchup-mayonnaise-and-a-nobel-laureate/). It basically consists of mayonnaise and ketchup – I didn’t realize this was a “thing” since mixing ketchup and mayo when eating fries seemed pretty usual to me. The seasoning makes the difference though! Preheat the oven to 200°C/430°F. Peel the potatoes. Cut them into 1cm/0.4in slices, then into sticks. Mix with the oil and spread in a single layer on a baking sheet lined with parchment paper. Bake for 30 to 40 minutes. In the meantime, prepare the dips. 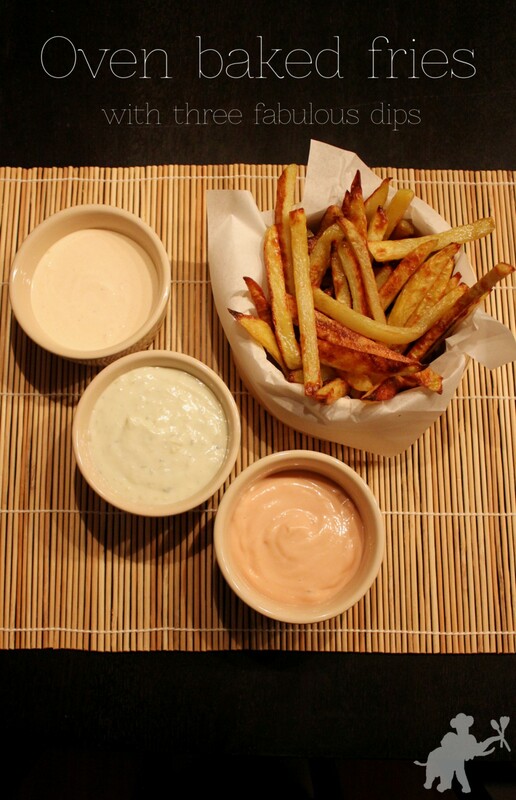 In two small bowls, mix the ingredients for the fry sauce and the spicy sour cream dip. For the blue cheese dip, chop up the shallot. In a small pot, melt the butter over medium-ugh heat and let the shallot brown in it. Once the shallot is golden brown, add the flour and stir und until butter and flour are combined. Add the milk and bring to a boil, stirring all all the time. Take away from the heat, add the cheese and let it melt in the hot milk. Stir until well combined, then transfer the sauce to a small bowl. Serve with the fresh fries right when they come out of the oven!